Assumed reason of the glitch: After a little testing, I've pin-pointed a cause for when quests do not register kill counts or work sometimes. For this specific type of bug, this affects quests that do work on the server. Some quests such as Mai's Training for example, require for you to kill monsters in order to progress. This quest can easily be bugged or glitched if you have an ongoing quest that is currently not working. To explain further, for example if you were to have Mai's Training as an ongoing quest (fully functional quest), while at the same time having Maria's Juice as an ongoing quest (not working currently). This will halt the kill count for the working quests to register. Meaning in order to fix this issue you must get rid of all quests that are not working at all. Most people assume you need to forfeit ALL quests, but you only need to forfeit quests that aren't working on the server. Assumed reason of the glitch: I tested this one for a while as well, there are 2 different scenarios. Note: While entering the Cash Shop, this causes for your character to be stuck in the map you were in until you relog or change channels. There are 2 different cases. Entering Cash Shop outside of the FM = Character being stuck in map you were in when you entered Cash Shop until relog/change channels. Entering Cash Shop while in the FM = Character will be stuck in the FM map until relog/change channels BUT once you exit the FM you will appear in Perion despite whether or not you were at a different location. Thanks for reporting this in detail, I have never realized how the bug happened.I never have a map saved cause I just warp everywhere and failed to notice this. CS map glitch is now fixed and will be applied next restart. Note: I was expanding my guild from 10 > 20, which would be 2 separate expansion costs. The dialogue states that each expansion costs 500k. Assumed reason of the glitch: I have inventory space in all sections but my character and pet cannot loot the quest items required to progress in the questline. Assumed reason of the glitch: I remade my character Lady on a separate account aside from my main. 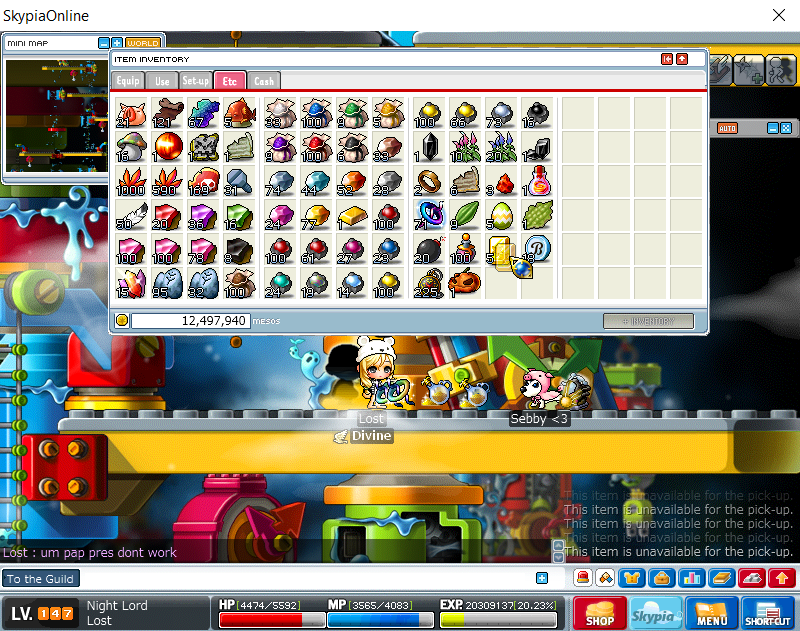 I tried to trade my freshly made character Lady some mesos in order to buy potions. Lady is Lv. 10, I tried to trade 2-3mil from Lost -> Lady but it kept crashing my client completely. 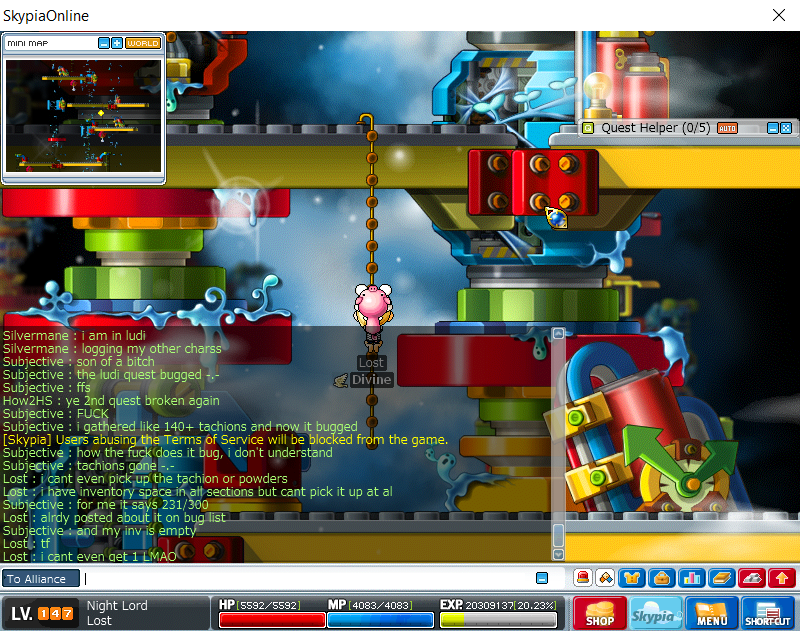 According to my friend he also tried to trade mesos to a guild mate that just joined the server when his character was a low level. Joseph -> Nick, he tried to trade 2 mil but it didn't seem to work either. I then tried to trade other characters to check if it was an account thing or a character thing.